The lack of refrigeration and storage required that food be bought in small quantities which is always more expensive that buying in bulk hence increasing the cost of food. The most common beverage was tea. 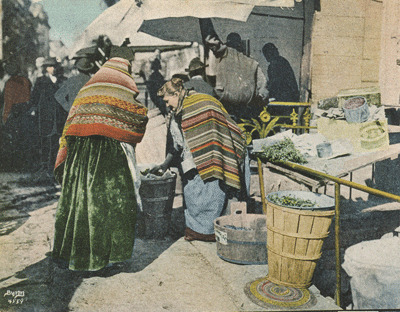 In addition to permanent shops, there were open air markets, and peddlers selling their wares from push cards. 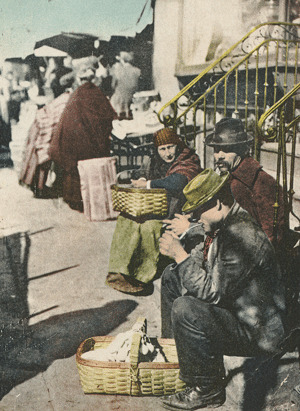 The peddlers frequently were at the same location every day. 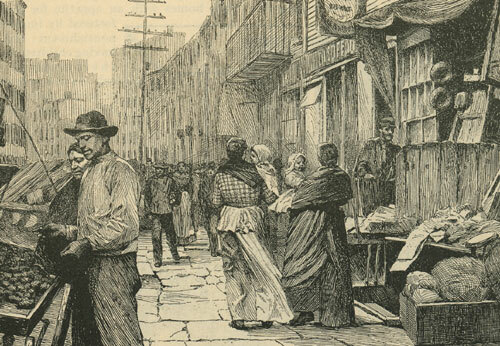 Everything was sold off peddler's carts — food, bedding, toys, etc. 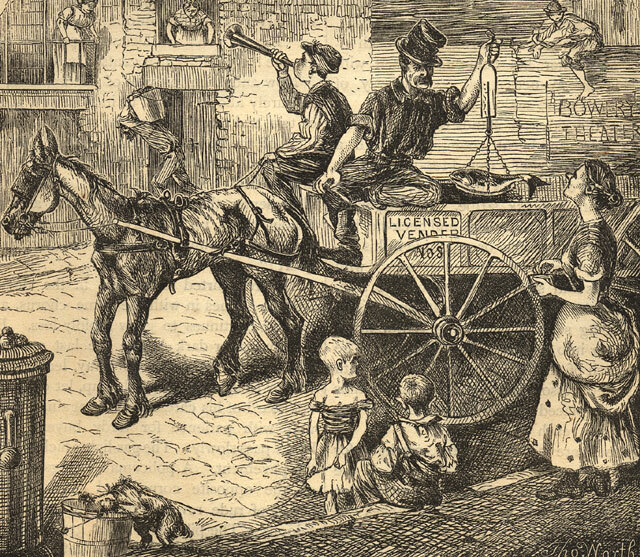 Some carts were seasonal such as: Ice cream and lemonade in the summer — Hot potatoes and corn in the fall. 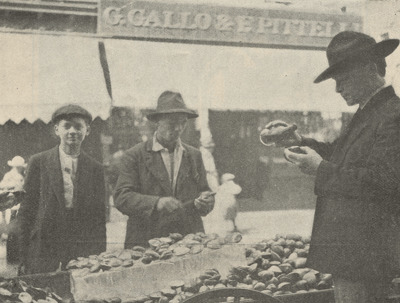 Some types of produce were more readably available in one neighborhood versus another — clams were popular in Italian neighborhoods but not sold in Jewish neiborhoods. New York Street Life. "Bretzel" Peddler. Not posted. New York Street Life. Vegtable Peddlers. Not posted. New York Street Life. 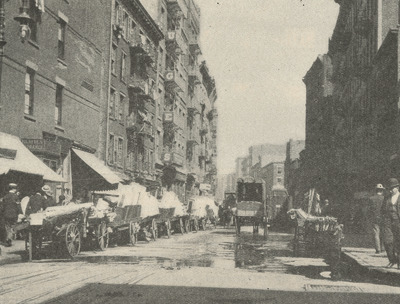 Cheese Venders on Mulberry Street. Not posted. While the women with their shawls pulled tight and the girl's blowing skirt indicate that the weather is at least chilly, no one is wearing an overcoat. "It is not known how many stores, or places in which trade is conducted beneath the shelter of a roof, the city contains. They are numerous, but they are not sufficient for the wants of trade. 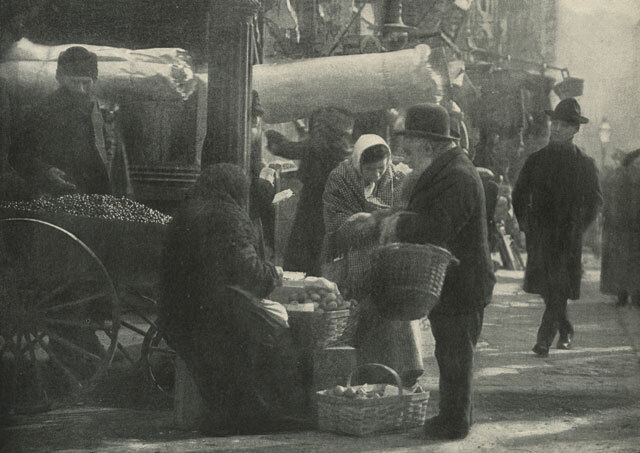 The sellers overflow them and spread out into the streets and by-ways, with no roof above them but the blue sky. Some of these sellers are men, some women, and some mere children. 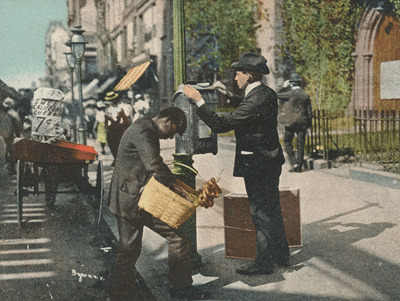 Some have large stationary stands, others roam about with their wares in boxes, bags, or baskets in their hands. They sell all manner of wares. Watches, jewelry, newspapers, fruits, tobacco, cigars, candies, cakes, ice cream, lemonade, flowers, dogs, birds,--in short everything that can be carried in the hand--are sold by the Street Venders. The rich and the poor buy of them. The strolling vagrant picks up his scanty breakfast at one of these stands, and the millionaire buys an apple at another. The eating and apple stands are mainly kept by women. The most of them are Irishwomen, and the big cap and dirty frill under the quilted bonnet are among the most common signs of such a stand. 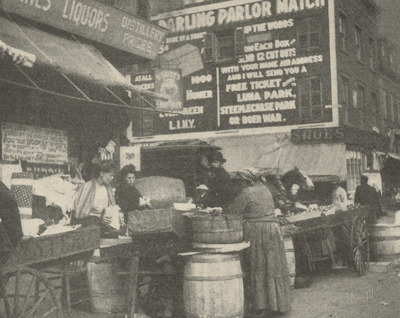 Some of these stands sell soups, some oysters, some coffee and hot cakes, some ice cream, and some merely fruits and apples. In Wall street they are kept by men, and pies and cakes form the staple articles of trade. Candies and nuts are sold exclusively by many. Such candies as are not to be had of any confectioner in town. Women never sell cigars or tobacco, though many of them never take their pipes from their mouths during business hours. 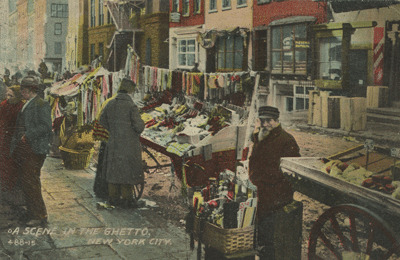 Some of them offer ladies' hose and gentlemen's socks, and suspenders, yarns, worsted hoods, and gloves. A few women sell newspapers, but these are rapidly giving way to men. 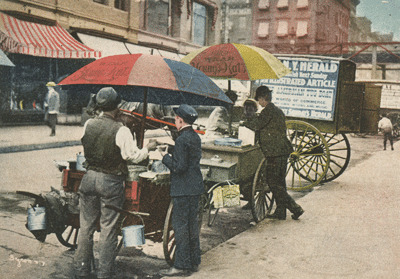 The newspaper stands are located principally on Broadway, in Wall street, and around the Post Office and the ferries. At some of them only the morning or evening journals are kept, but others offer all the weeklies and the illustrated papers as well. The venders of cheap neckties and pocket book straps are mostly boys or very young men. They frequent the lower part of Broadway, which is also the favorite haunt of the venders of cheap jewelry. Pocket books of every description are sold at marvellously cheap prices, and photographs are displayed in such lavish quantities that you feel sure that every dealer in them has bankrupted himself in order to afford a free art exhibition to the crowd of little ragamuffins gathered around him. Toys of every contrivance adorn the stands above Canal street. The dealers in these articles are strong, able-bodied men, who prefer to stand on the side walks pulling the strings of a jumping jack, or making contortions with a toy contrived for that purpose, to a more manly way of earning their bread. The balloon men, the penny whistle and pop gun dealers frequent the upper streets, where they are apt to be seen by children. The lame soldier sets up his stand anywhere, and deals principally in shoe strings, neckties, or in books and papers that no one ever reads. Towards Christmas large booths for the sale of toys are erected on some of the east and west side streets, at which a thriving business in toys and fire-works is carried on. 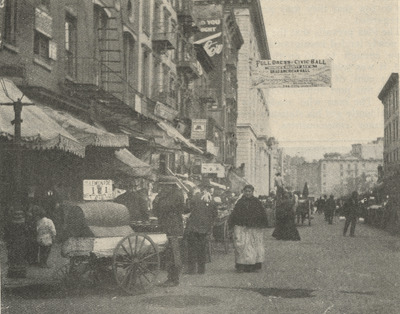 The Chinese candy and cigar sellers are to be found between the Astor House and the South Ferry. No one ever seems to buy from them, but they continue in the business, and thus afford proof positive that they have their customers. The dog and bird men haunt the neighborhood of the Astor House and St. Nicholas hotels. They get high prices for their pets. Dogs sell readily. It is the fashion in New York to discourage the increase of families, and to attempt to satisfy the half-smothered maternal instinct by petting these dumb creatures. Little girls are numerous among the street venders. They sell matches, tooth-picks, cigars, newspapers, songs and flowers. The flower-girls are hideous little creatures, but their wares are beautiful and command a ready sale. These are made into hand bouquets, and buttonhole bouquets, and command from ten cents to several dollars each. 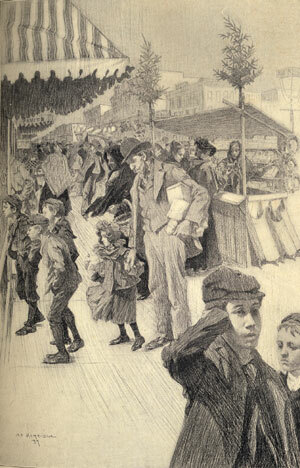 When the day is wet and gloomy, and the slush and the mud of Broadway are thick over everything animate and inanimate, and the sensitive soul shrinks within itself at the sight of so much discomfort, the flower-girls do a good business. The flower-stands then constitute the most attractive objects on the street, and men are irresistibly drawn to them by the sight of their exquisite adornments. It is very pleasant at such times to have a bright, fragrant nosegay in one's buttonhole, or to carry a bouquet to one's home. On such days you may see hundreds of splashed and muddy men on the great thoroughfare, utterly hopeless of preserving any outward semblance of neatness, but each with his nosegay in his buttonhole; and as he glances down at it, from time to time, you may see his weary face soften and brighten, and an expression of cheerfulness steal over it, which renders him proof against even the depressing influences of the mud and the rain. 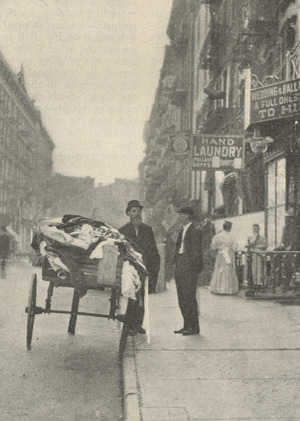 For general information about and pictures of life in the tenements, click on the image of the laundry in the tenement yards.